The crisis situation made Japanese people more courageous and united to rebuild the country. 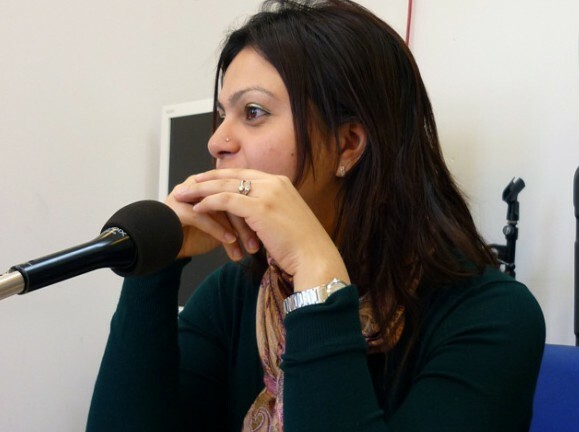 Tasnoova Tahia, a Bangladeshi woman who lives in the waterfront area of Tokyo, will be our guest on My Eyes Tokyo radio program on 84.0 ChuoFM on April 16 and April 23, 2011. She has written an essay about her experience. We got earthquake alert from the emergency center of our building 20-30 seconds before. I just got back home when the alert went on, on 11th march, around 14:45. As always, I did not bother as I had gotten used to it already and continued what I had been doing. Wow… It started and wouldn’t stop! Oh, it’s getting bigger and our building is shaking terribly. “What is happening to the world? Should I stay up or go down?” The emergency center was making announcements continuously, advising us to calm down and keep waiting somewhere safer until the earthquake stopped. I watched my stuffs falling down and breaking into pieces. I couldn’t sit idle. While the tremor was going on, I attempted to put things like photo frames, art pieces and standing lamps down on the floor. That was not a wise thing to do, though, during an earthquake. For a while, it seemed to stop. I thanked God. I tried calling my husband and friends living in Japan thousand times using my cell phone and land phone but could not connect. I got scared even more. Oh my Good Gracious, it came back! Another tremor; seemed to have been bigger than the earlier one. I said to myself – this was the end of it. I was certain that I was going to die. I tried remembering my parents’ faces and wished good luck to my younger brothers. The earth never settles down? Although big tremors stopped, aftershocks kept shaking us from time to time. I could not sleep that night and the next two nights too. Aftershocks kept haunting me. I felt quakes even though there weren’t any. The earth never seemed to settle down. Nevertheless, I was amazed to see how efficiently the Japanese people have been trying to cope with the problems. One trait of this nation that leaves me speechless every time I notice is the cooperativeness. The crisis situation did not break them down, rather, made them more courageous and united to rebuild the country.